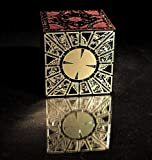 While not quite as diabolical as the infamous Lament Configuration Puzzle Box from the movie Hellraiser, those somehow able to solve this cool new LightBox³ Puzzle Box will also end up in darkness, except it's just the normal demon-fee kind. 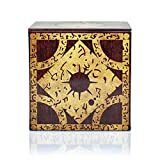 This unique multi-layered puzzle box brainteaser is a glowing stack of clear acrylic platelets, each with photo-etched silver circuitry and illuminated LEDs, that snap together magnetically. To solve the puzzle means to find a way to turn off all the interconnected lights on each layer by rotating and repositioning each one. If it all goes dark, you win, but there's only one combination of layers that will do it. A second way to win would be to just let its rechargeable battery run out, but that's obviously not as fun. 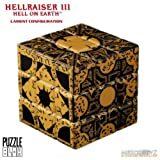 It also includes a handy felt puzzle sleeve that wraps around it just in case you can't stand the light in between turns trying to solve it. Perfect for anyone bored at the office, those who need an interesting bedside nightlight, or electricians who really enjoy a good challenge.